Of the many Gods and Goddesses that populate the labyrinthine depths of Hindu mythology, Lord Indra, the God of Rains and the King of Heaven, occupies a prominent place in quite a few narratives. From blessing lands with bountiful rains to indulging his passion for beautiful women, from sanctioning celestial weapons to warriors to piquing meditating sages, mythical narratives are replete with details highlighting the many shades of this divine entity. These tales not just illuminate various facets of Lord Indra’s personality, but some of them also become the foundation for celebrations amongst the earthlings who worship him. One such tale centres around his adventures as a flower thief on earth and forms the core of the eight-day long Indra Jatra Festival celebrated by the Newar community of Nepal. The Newars are the original settlers of the Kathmandu valley and pride themselves as the custodians of the religion, culture, and civilization of Nepal. The excitement on the streets is a curious mix of religious fervour and carnivalesque revelry. In a sea of people filling every inch of the streets, masked dancers continue to make way for their performances. Every now and then, a band of musicians marches by, filling the air with sounds of cymbals and drum. The strangers that make up the crowd radiate an aura of cheerful benevolence and bonhomie, easing the discomfort of the pushing and shoving happening around. Monsoons have wrapped up and it is time to give Lord Indra, the rain God, a hearty send-off. And the Nepalese are doing it in their traditional style – with sombre religious rituals and boisterous street performances. I am at the Basantapur Durbar Square, the hot spot to witness the Indra Jatra celebrations in Nepal. Here is a little account of my understanding of the festival. The annual Indra Jatra Festival or Yenya as the locals call it in Nepali is the biggest festival of the Newar community. Yenya literally translates to the ‘Festival of Kathmandu’. The festival dates back to the 10th century and was started by King Gunakamadeva to commemorate the founding of the city of Kathmandu. The festival has many legends associated with it. As per the most popular legend, Lord Indra descended on earth to steal the rare Parijat flowers from a garden. Caught in the act, he was captured by the locals who refused to believe he was who he claimed he was. As time passed, Indra’s worried mother Goddess Dagin came down to earth, looking for her son. On finding her son held captive, she revealed his identity to the captors who then released him. In return, Dagin blessed the locals with good rains for a bountiful harvest and promised to take back with her to heaven the souls of all those who had died in the past year. Indra Jatra Festival is a representation of that incident and lasts for eight days with singing, mask dancing and rejoicing along with other rituals. As a re-enactment of Indra’s capture by the locals, a bust of Indra with his hands bound is put on display at Maru Tole (street) and other places during the festival. As per another legend, the festival is celebrated in the honour of Bhairav, who is Lord Shiva’s manifestation and is believed to destroy evil. Celebrated by both the Hindus and the Buddhists, the festival has two parts to it – the Indra Jatra and the Kumari Jatra. 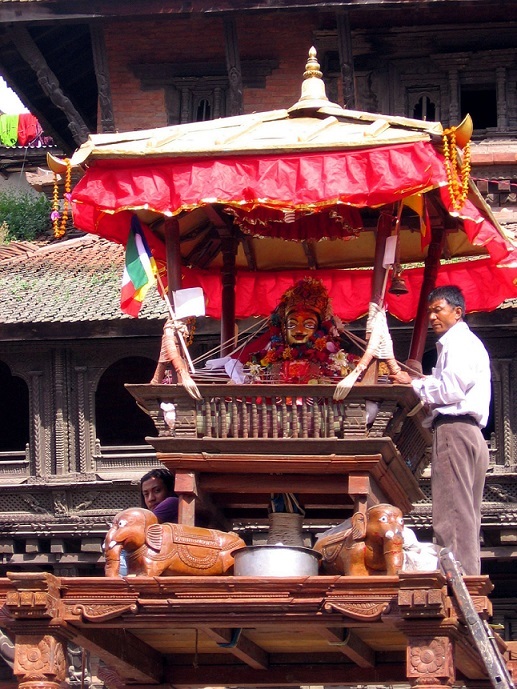 While the Indra Jatra involves ritualistic worshipping and religious enactments by mask dancers, in Kumari Jatra the chariot of Kumari, the Living Goddess, is taken out in a procession through the main streets of Kathmandu. 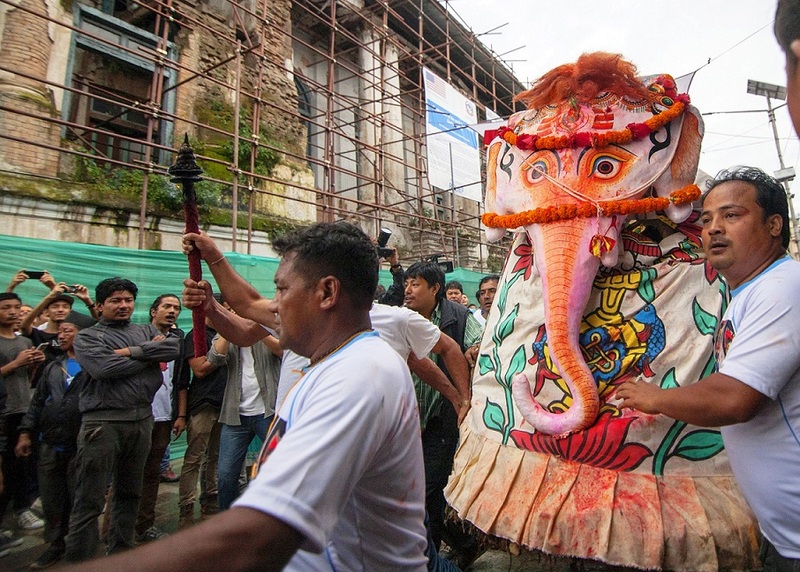 The eight-day-long Indra Jatra festival commences with Yosin Thanegu – the ritualistic erection of Indradhoj Lingo (Yosin Pole), a sacred ceremonial wooden flagpole at Hanuman-dhoka in Basantpur Durbar Square in Kathmandu. This is followed by the rare display of masks of Bhairav at various places across the city. Of them, the masks of Swet Bhairav is the largest and is only displayed for the public during the festival days. Classical dancers also assemble at the spot, wearing different kinds of traditional masks and costumes and dance around the courtyard of Hanuman-dhoka to celebrate. The first day of the Indra Jatra festival is also observed by the Newars as a day to remember the family members who passed away during the past year. In the evening, the families in mourning light up lamps along a traditional route covering all the parts of the old city of Kathmandu. This route, referred to as the Upaku Route family members of the deceased tour along this route lighting small butter lamps in their remembrance. Of the various rituals associated with the Indra Jatra festival, I immensely enjoyed learning about the Lakhey dance. 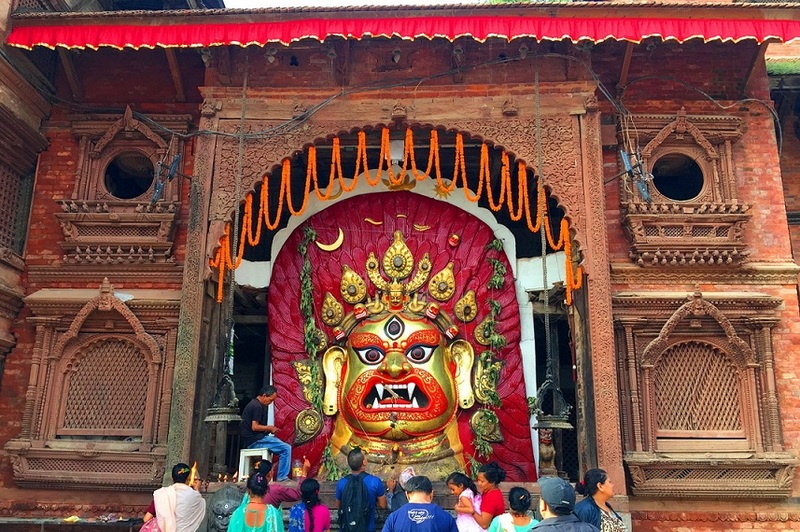 In Nepali folklore, Lakheys are fearsome demons with a ferocious face, protruding fangs, and mane of red or black hair. While they are frightening to look at, they are regarded as the guardian of the city, protecting it from drought, diseases, accidents, and evil spirits. Amongst them, Majipa Lakhey is a special Lakhey who is also known as the peaceful Bhairav and is considered the protector of children. 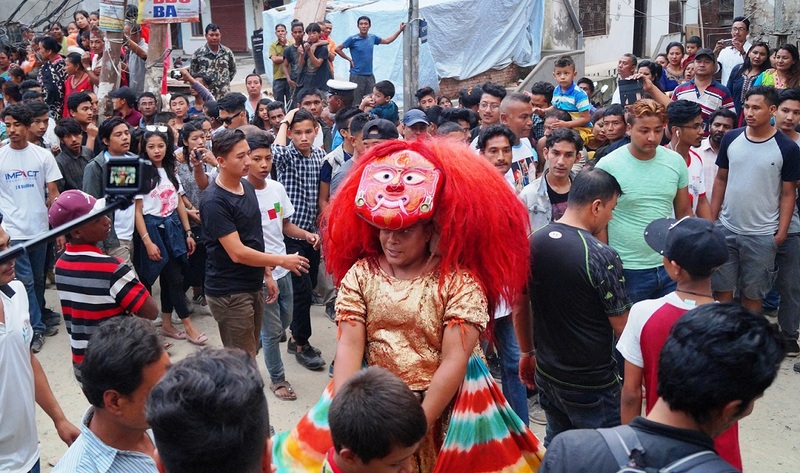 During the Indra Jatra festival, Majipa Lakhey dances are performed on the streets of Kathmandu with the performers wearing Lakhey costume and masks. City dwellers offer food and ritual items to him as he moves through the city accompanied by his musical band giving dance performances. Yet another much-awaited part of the Indra Jatra festival is the Kumari Jatra. 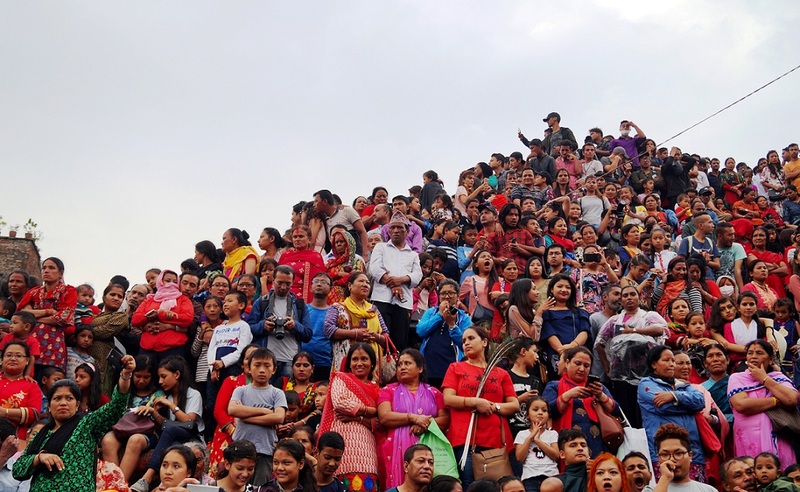 Hundreds of people gather around the Kathmandu Durbar Square to catch a glimpse of the Kumari being charioted around the streets in a festooned chariot. In Nepal, the Kumari refers to the Living Goddess who is worshiped by both the Hindus and the Buddhists. The Kumari, a pre-pubescent girl, is chosen based on several physical traits and tough tests and is worshipped as a reincarnation of the Hindu goddess Durga, known in Nepal as Goddess Taleju Bhawani. Before the arrival of the Kumari, Nepalese officials and consular staff gather in front of Durbar Square for a ceremonial military parade. After the parade comes Kumari’s chariot procession. Before the Kumari’s public appearance, two girls representing Lord Ganesha and Lord Bhairav come out from the home of Kumari and ride different chariots as the attendants of the Goddess. A glimpse of the Living Goddess is supposed to bring good fortune and this belief is underscored by the huge number of people who gather on the streets to have a glimpse of the Kumari and receive her blessings. Here’s a glimpse of the crowd at the Durbar Square waiting for the Kumari to emerge from her house. The chariot procession takes places on three days. As the chariot procession wraps up on the third day, Goddess Dagin comes out wearing a white mask and travels the same route the chariot took for three days. People who have lost their family members the same year travel behind the Daangi scattering satbij (seven different grains) and pray for the deceased. Another major attraction of the Indra Jatra festival is the Pulu Kisi, also known as Tānā Kisi – a wicker representation of an elephant, who is believed to be the vahana (vehicle) of Lord Indra. When Indra got imprisoned for stealing flowers, Pulu Kisi went through the streets of the ancient city Kathmandu in search for his imprisoned master. During the festival, this incident is portrayed by way of a procession where a dancer in Pulu Kisi mask runs through the streets, amusing people with his dance and naughty antics. 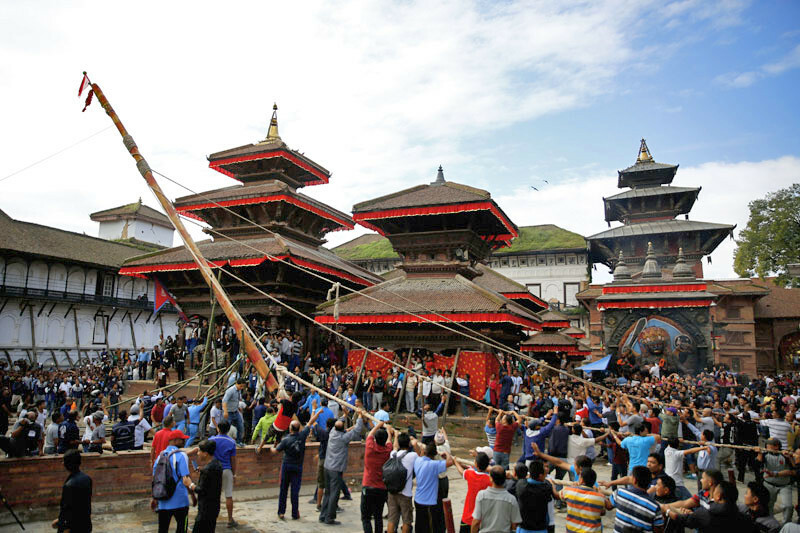 On the last day, the flagpole erected at Kathmandu Durbar Square is brought down, accompanied by religious rituals and animal sacrifices signifying the end of Indra Jatra festival. The Newari community living in our own Sikkim as well celebrates the Indra Jatra Festival. The festival was introduced in the state in the year 2000 followed by its declaration as the state holiday in 2011. Witness the Indra Jatra Festival in 2018! 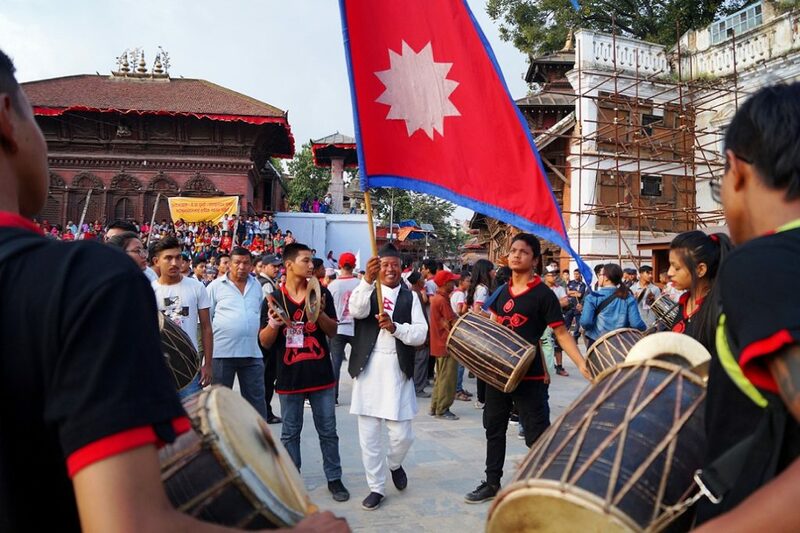 This year the Indra Jatra festival commenced from the 5th of September and I was lucky to experience it first hand in the capital city of Kathmandu. 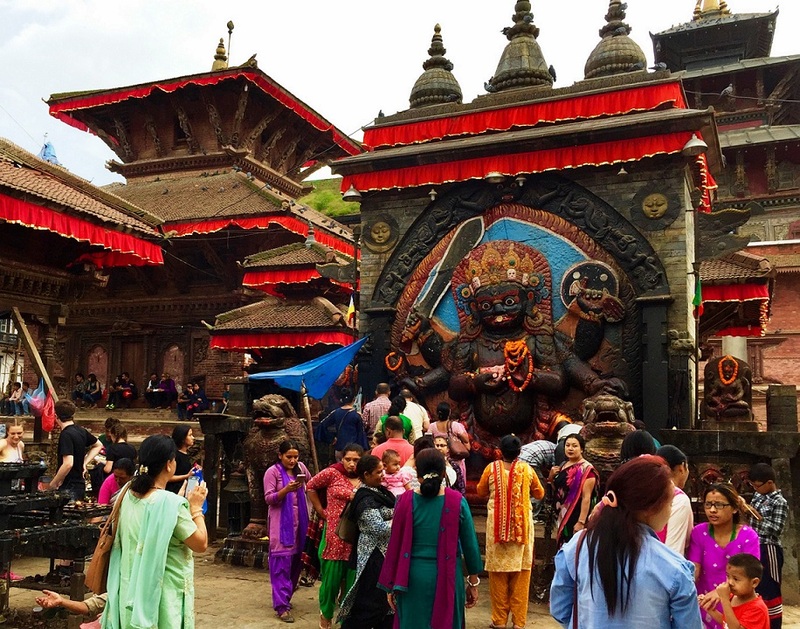 It was a unique opportunity to experience Nepal’s amazing cultural ethos, and also catch a glimpse of the Living Goddesses of the valley – the Kumari. Every year, the Indra Jatra Festival sees a massive turnout of local and foreign observers alike. The festival is celebrated according to the Lunar calendar so the dates are changeable. It generally falls in the month of September indicating the end of the monsoon. So if you happen to be in Nepal around that time, then do plan up to experience this colourful cultural extravaganza first hand. Wrapping this post with a small video clip of the festivities underway at Basantapur Durbar Square during the Indra Jatra Festival this year. 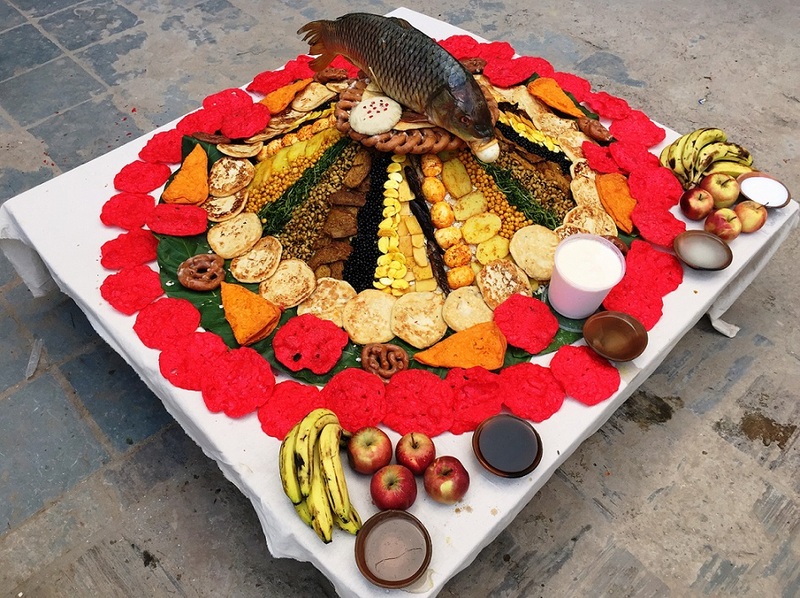 Along with this video, there’s also a photo of the very colourful and an awe-inspiring display of Samay Baji – a traditional dish of Newar community. During the Indra Jatra festival, Samay Baji mounds are beautifully displayed on street corners and are later distributed to devotees as prasad. More on this in the next post. Hope you enjoyed reading this post. Please stay connected for more stories from Nepal. Also, have you been to Nepal? If you have, then do share your take on this beautiful country in the comment box! Note: I was invited to witness the Indra Jatra Festival in Nepal by Explore Himalaya Travel& Adventure, in association with the Nepal Tourism Board. Enjoyed reading about the details of the festival. Very interesting rituals! Red and black mostly! Interesting! stunning and colorful images, Ragini! To think our brother to the north could have so many under-explored destinations.